Restaurant chairs come in many different materials, which means you can find the perfect, stylish piece to match your existing furniture or decor. Our restaurant bar stools are designed for use with your bar or countertop. Choose from a variety of finishes and designs to elevate guests in style. Our booths and benches come in a variety of layouts. They’re designed to create a cozy environment for guests while offering enhanced privacy. For all your large-scale seating needs, try our selection of event seating including folding chairs and plush church chairs. 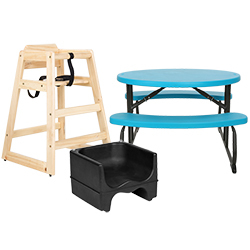 Our selection of childrens seating ensures your baby, toddler, or child can sit safely and comfortably at the table. When your chair, booster seat, or barstool breaks, use these chair parts and accessories to quickly make it functional again. When you choose comfortable and practical restaurant seating, your guests will enjoy staying at your business for longer amounts of time. 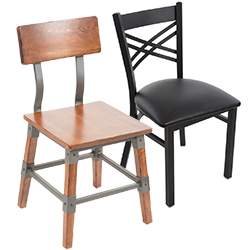 We have restaurant chairs, booths, stools, and high chairs for all types of businesses. You can also find church and auditorium chairs for other venues where visitors will be seated for lengths at a time. Don't forget to look at our office chairs for comfortable seating options, too. If you're looking for additional restaurant furniture, you may want to look at our restaurant tables, folding tables, and outdoor restaurant furniture. If you're wondering where to buy restaurant seating, we have a large selection of restaurant seating for sale at the lowest prices. When you want to maximize your space without sacrificing comfort for your guests, stackable chairs are the perfect solution! 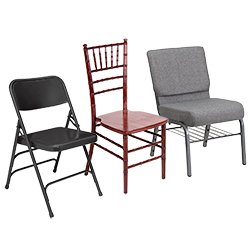 Our selection of stackable chairs caters to the needs of every venue. 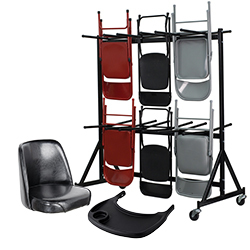 Whether you're looking for some replacement chairs or this is your first time buying, we can help you find the perfect stackable chairs and accessories for your establishment. Restaurant high chairs and booster seats are the perfect way to keep your youngest customers safe and comfortable. In order to cater to a variety of ages, it’s important to include both high chairs and booster seats when determining your restaurant seating options. While each option comes with its own features and benefits, high chairs are more suitable for infants and booster seats are great for toddlers. Restaurant seating is an essential part of any dining establishment. From casual bars to upscale restaurants, creating a comfortable and relaxing space for guests to sit enhances their overall experience. Provide the right seating options for your guests to encourage longer visits, which can increase sales and promote a positive lasting impression. We provide seating in a variety of heights, materials, and designs to create the perfect atmosphere for any dining room. 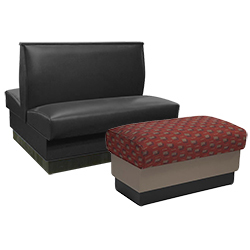 We offer many different types of restaurant seating designed to fit your specific needs. 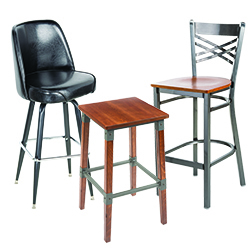 Our restaurant bar stools are built to elevate guests for comfortable seating at your bar top. Or, for a cozy, intimate feel, our booths and benches feature a plush construction and come in a large assortment of colors. To ensure you’re meeting the needs of every guest, we even offer seating built just for children. From catering jobs to pizza shops, we have the perfect commercial restaurant seats to fit your budget while creating a comfortable atmosphere.